Omaxe Aananda is a residential development of Omaxe. Located in Naini, Allahabad, it is built across a wide area. These luxurious 1BHK, 2BHK and 3BHK housing units makes it a dream home to everyone. These apartments are beautifully crafted with modern amenities and is approved by UP RERA. Where is Omaxe Aananda located? The project is located in Naini, Allahabad. What are sizes of apartments in Omaxe Aananda? The apartment sizes in the project range from 850.0 sqft to 1710.0 sqft. What is total area of 1 bhk in Omaxe Aananda? 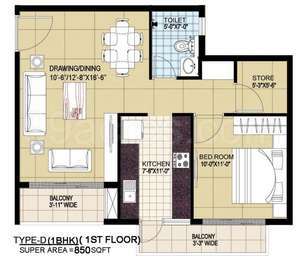 1 BHK unit in the project are available in an area of 850.0 sqft. What is size of 2 bhk in Omaxe Aananda? The area of 2 BHK apartments ranges from 1100.0 sqft to 1360.0 sqft. What is total area of 3 bhk in Omaxe Aananda? 3 BHK units in the project are available in a size of 1450.0 sqft to 1710.0 sqft. What is the area of Omaxe Aananda?The total area that the project occupies is 11.0 Acres. Sufficient light points, fan points, 6/15 AMP sockets A/C points in living/dining and bedrooms provision for, telephone etc. With approx. 101 mn. sq. ft. of delivered space in both real estate and construction contracting, Omaxe is one of India's leading and trusted real estate companies. The brand 'Omaxe' came into existence in 1987, when visionary and first generation entrepreneur and civil engineer Mr. Rohtas Goel laid the foundation to undertake construction and contracting business. And since then, Omaxe has moved from strength to strength. at includes Integrated Townships, Hi-Tech Townships, Group Housing, Shopping Malls, Office Spaces, SCOs and Hotel. It is currently undertaking 39 real estate projects - 13 Group Housing, 16 Townships, 10 Commercial Malls/office spaces/Hotels/ SCOs. Guided by its founding values -- values of delivering quality and excellent real estate spaces, ensuring customer satisfaction, and redefining lifestyle - Omaxe group forayed into the evolving real estate sector in 2001 and within a short span, the company emerged as one of the largest real estate companies having delivered some renowned and highly appreciated projects. Since inception, the company has always enjoyed utmost trust and confidence of the people and this got reflected in 2007, when the initial public offer of the company was oversubscribed close to 70 times.